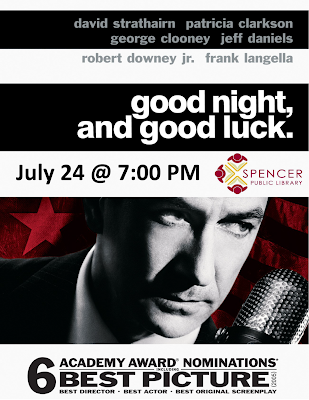 Adults will be watching the historical docu/drama movie, Good Night, and Good Luck starring David Strathaim, Patricia Clarkson, and George Clooney. When Senator Joseph McCarthy begins his foolhardy campaign to root out Communists in America, CBS News journalist and radio broadcaster, Edward R. Murrow, dedicates himself to exposing the atrocities being committed by McCarthy's Senate "investigation." Sign-up at the front desk to reserve your copy today!